The Warpia StreamHD with HD video and digital audio enables users to stream any content from their Windows based PC wirelessly to an HDTV or Projector in 1080p high definition. Content such as streaming video, pictures, movies, presentations, Facebook, Twitter and other applications can be shown on your HDTV in the room without the hassle and clutter of wires while you continue to use your laptop screen to surf the web, check email, and more. Two screens at once. Warpia extends your world wirelessly. Whether wirelessly connected to an HDTV in the living room or a projector in a meeting room, Warpia allows users to easily and conveniently extend their PC workspace. Providing both HDMI, common in HDTVs and increasingly available in PC monitors, as well as VGA outputs, Warpia provides users with a simple, single-cable connection to their target display. The included 3.5mm stereo audio jack enables users to stream stereo audio to virtually any speaker system, or the audio can be streamed through the HDMI output. A SPIDF output allows you to enjoy digital stereo sound. Enjoy content from your favorite video streaming sites at full resolution: Hulu, Netflix, YouTube, Amazon Video on Demand, and more, all on your HDTV. Turn the Internet experience into a home theater experience. 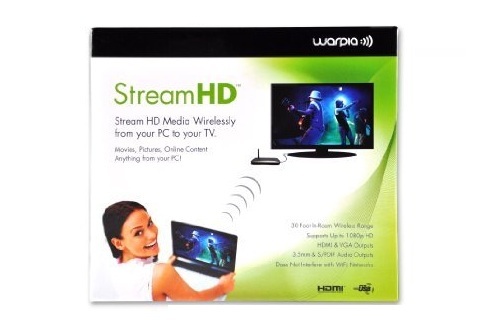 The Warpia StreamHD has a 30-foot, line-of-sight wireless range for streaming content between your computer and your display. So even if your computer is across the room, or even in the next room in line-of-sight, you can enjoy full 1080p playback of your digital video and audio. In addition to using your HDTV as a target display for your laptop or PC content, you can also use the StreamHD in "mirror mode", allowing your HDTV to mirror the same desktop screen as your laptop or PC simultaneously. Customers can buy with the assurance that Warpia's Tech Support Team is available to help if any issues may arise. Quick turnaround support enables users to instantly tap into Warpia's expertise, which will allow for optimal performance. 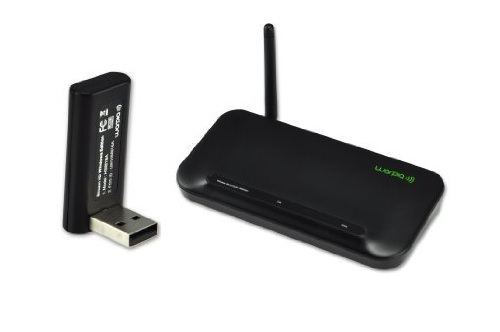 Warpia StreamHD Wireless USB Adapter for PC, video base with HDMI and VGA video outputs, SPDIF and 3.5mm audio connectors and a wireless USB input/output connection, power supply unit, Quick Start Guide, installation and documentation CD. Price: $129.99 & FREE Super Saver Shipping.